This picture was taken at the Hard Rock Cafe in L.A., about eight years ago. 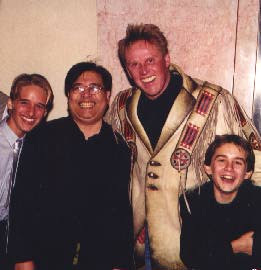 It commemorates the day we got Gary Busey, Miko Hughes and Jeremy Lelliott to attach themselves to my film Little Savages. Porchlight Entertainment, who held the rights to my script at the time, threw the dinner. What a day of optimism this was! Aurora, the executive at Porchlight, had just greenlighted the film. I was finally going to direct something with an actual budget. We had a super cast lined up. My sneaky idea to cannibalize Roger Mende's derelict spaceship set, sitting in an old Sun Valley warehouse, was about to come to fruition. So here I am in Bangkok, eight years later, more famous than ever now because the world's culture mavens picked up on what we were doing with the opera company ... yet at the same time beset by more insane problems than I ever imagined possible. As I enter the third (and presumably last) Act of the screenplay of my existence, I see all the different threads miraculously drawing together. I'm hoping that the conclusion will be a "chase to the finish".